Sacred Hearts Academy - The Blog: CyberPatriots Place in State Rounds, Advance To Semi-Finals! Results are in! After a grueling CPXI State Round, where teams were tasked with securing 3 computer images (Windows 10, Windows Server 2016, and Ubuntu 14), taking a Cisco Networking Challenge quiz, and a Packet Tracer exercise requiring completing a computer network. 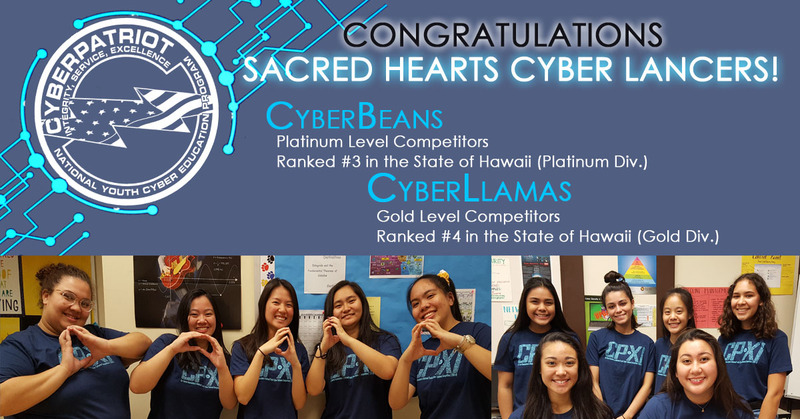 The Sacred Hearts Academy CyberBeans placed 3rd in Hawaii in the Platinum Tier and the CyberLlamas placed 4th in Hawaii in the Gold Tier! Both CyberLancer teams advance to the Semi-Finals Round where the challenges will increase in intensity once again! Also advancing to the Semi-Finals Round will be Cyber team H2A – our middle school team! Congratulations to all!